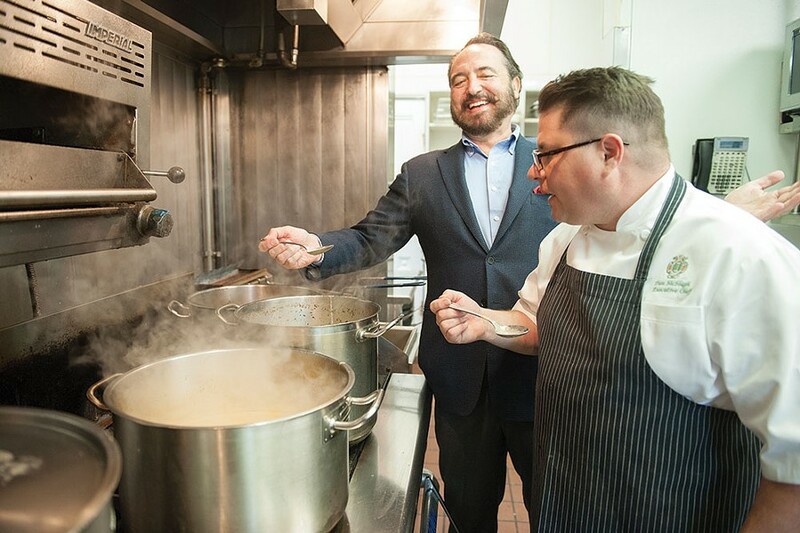 Photo by Mark McKenna Chef Nick Stellino in the kitchen with Dan McHugh, executive chef of the Ingomar Club. Courtesy of Nick Stellino. North Coast shrimp with Italian flavor. As a boy in Sicily, Nick Stellino's friends called him "Nick Americano," never Nicolo. He dreamed of visiting America and jumped at the chance to study abroad in 1975. Looking at a map of California, he saw Eureka was a mere finger away from Los Angeles and thought, perfecto. "The first place I arrived in America was Eureka, which completely shaped my character as a person," says Stellino, who waxes poetic about the city's integrity and the strength of its citizens. For teenage Stellino, the historic downtown, humbling redwoods, ice cream shops and Friday football games were like an exotic land where his dreams came true. Today, thousands of fans and viewers watch Chef Nick Stellino cook on public broadcasting stations across America. Through shows like "Cooking with Friends" and "Cucina Amore," Stellino has been a storyteller and a teacher for the past 20 years. Last week, Stellino and his wife, Nanci, returned to Eureka for a walk down memory lane and to cook up a KEET benefit dinner on Oct. 3 with the Ingomar Club's kitchen staff in the same Carson Mansion he once rode past on his bike. Of course, back then Nick Americano was far more interested in American football than cooking. By the time Stellino returned to Sicily, he'd gained 45 pounds eating hot dogs with extra onions and cheese from the local Coney Island stand. He says simple, healthy Italian meals from his mother's hand-written recipes quickly put his weight back on track and reconnected him to home. Years later, Stellino found himself with a successful career trading stocks in New York City. But following the loss of his favorite uncle, Stellino came home from his office one day and told his wife, "I quit." The very next day, Stellino hit the pavement and found himself a dishwashing job at an upscale French restaurant. 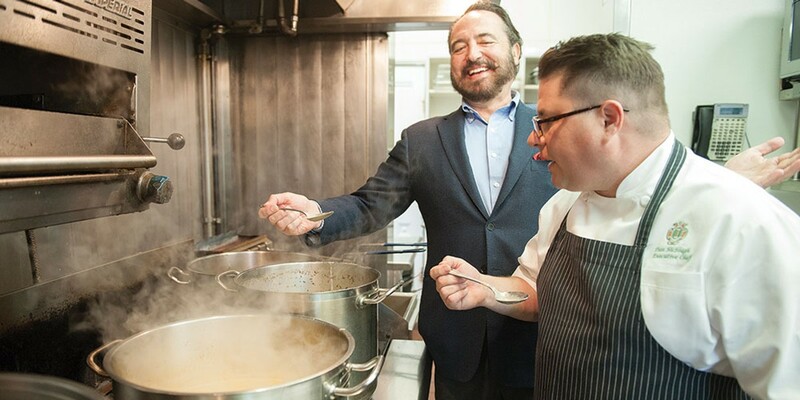 For the privilege of earning his stripes in the kitchen, Stellino says he paid the French chef $5 a day. He worked his way up from dishwasher to manning the kitchen at some of New York's best restaurants. After years as a successful chef, serendipity landed him an interview with an advertising agency. In a matter of days, he was the new face of Ragu, with a foot in the door to a television career. Stellino's style cannot be pigeonholed to any one cuisine, though he is undeniably influenced by his Sicilian roots. "Like anyone," he says, "I get caught up in something that interests me and strive to understand it, make it perfect." The depth of his culinary repertoire is easy to understand if you've followed Stellino's work over the years. As one of few chefs in the country who operates his own production company, Stellino Productions, he has earned himself the freedom to follow his interests on his shows, in e-cookbooks and one-minute online recipe videos. His newest endeavor, "Storytelling in the Kitchen," comes to PBS stations next year and will explore the timeworn rituals that bring people back into their kitchens. Stellino is also profit-sharing with KEET TV on a discounted membership to his website through www.keet.org ($9.98), which buys a year's access to all of his recipes and exclusive how-to videos. To warm up your kitchen skills, try your hand at this rustic, yet elegant dish that honors the simplicity of Italian food and the seafood of the North Coast. For a foolproof experience, visit www.nickstellino.com to watch a video of the chef himself preparing the dish. Buon appetito. Make the chardonnay sauce first. In a saucepan, combine the extra light olive oil and diced bacon. Cook over medium heat, stirring well, until the bacon is nicely browned, about 3 to 4 minutes. Using a slotted spoon, transfer the bacon to a dish lined with a paper towel and set aside. To the same saucepan, add the garlic, onion, carrot, celery, bay leaf and red pepper flakes. Cook over medium-low heat, stirring well, for 4 to 5 minutes. Increase the heat to high and add the chardonnay; bring to a boil and reduce by half, about 4 to 5 minutes. Add the chicken broth, then bring to a boil and cook, stirring well, for 5 more minutes. Reduce the heat to medium-low and cook for 30 minutes. Strain the sauce into a bowl and discard all of the ingredients left in the strainer. Pour the strained sauce back into the saucepan and bring to a boil over medium-high heat. Add 1 teaspoon of the butter-flour mixture and stir well with a wire whisk; wait 1 minute and repeat. Stop this process when the sauce is finally thickened to your liking. Usually a tablespoon of the butter-flour mixture is more than enough, but just in case you want it, you've got more on hand. Salt to taste. Keep the sauce warm until you're ready to serve it. Next, prepare the garbanzos, arugula and sundried tomatoes. Add the butter to a sauté pan together with the garlic, red pepper flakes and onion. Cook over medium-low heat, stirring well, for 3 to 4 minutes, until the garlic starts to brown and the onion is translucent. Add the garbanzo beans and the sundried tomatoes, and cook, stirring well, for 3 more minutes. Then add the arugula salad; stir well and cook for 1 more minute. Adjust salt and pepper to taste. Set aside and keep warm. Lastly, prepare the shrimp. Mix together the ¾ teaspoon salt and ½ teaspoon pepper, the garlic powder, onion powder and paprika. Sprinkle the mixture evenly over the shrimp. Add the olive oil to a large nonstick sauté pan and cook over high heat until it starts rippling, about 2 minutes. Add the shrimp and cook, stirring well, for 2 to 3 minutes, until the shrimp is cooked through. 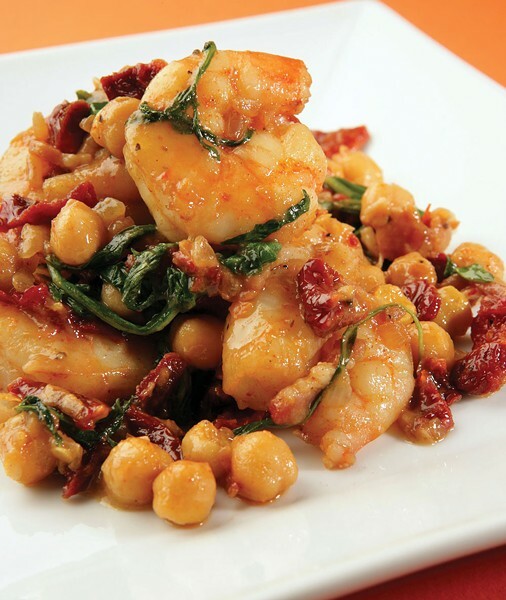 Using a slotted spoon, place the shrimp on a plate lined with a paper towel to absorb the excess oil. Divide the cooked shrimp into 4 portions and place on top of the vegetable mixture in the middle of each serving dish. Pour the chardonnay sauce on the side, and serve.